While we were gone last week The Man and I went out golfing one evening. 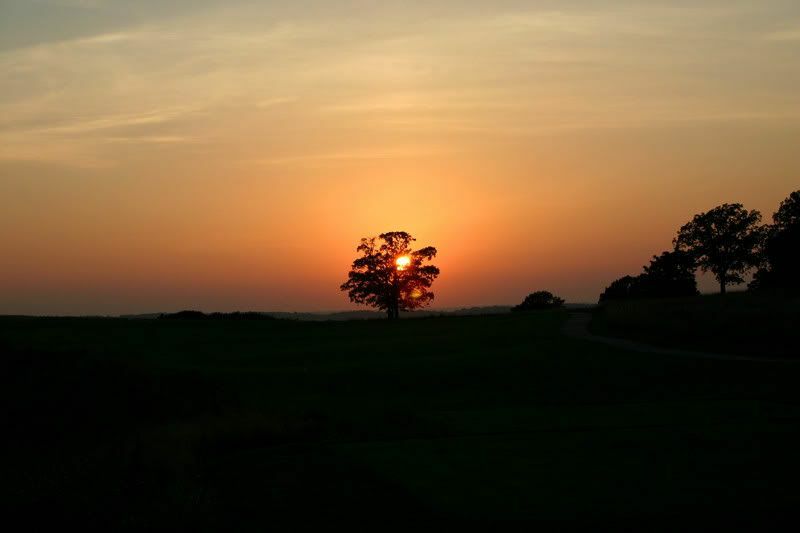 (He golfed, I rode and snapped pictures, but hey...) But this was the sunset that evening and it was such a beautiful end to a perfect day, blessed by God. What a beautiful picture..Isn't there so much beauty on this earth? Sometimes we are so caught up in things, we forget to look..Happy for Fingerprint Friday..makes us all stop and look around at God's beauty..
What a spectacular shot! I love sunsets. They are such a beautiful Fingerprint of God's presence. Thanks for your comments on the P's of Blogging...I realised after I commented that it was a post from ages ago, so thought i would give you a more up to date "thank you " as well ! I love this idea! What lovely pictures everyone! I love this idea, thank you for offering it. Fingerprints of God. I have never heard this song before but I'm looking it up now. I'm posting my Fingerprints of God that I can think of right now. :) Peace!